Slide presentations, often called PowerPoint presentations, have a bad reputation accumulated by countless mediocre presentations. The fact behind this sad state of affairs is that a vast majority of professional lecturers and other speakers have never come to terms with slide presentations based on software like PowerPoint and Keynote. In classrooms, at seminars, at conferences, and at business meetings they deliver slide presentations that bear all the hallmarks of poor design thinking. Most presenters give presentations that don't cash in on the didactic potential of the bimedial format (speech + visuals). They give presentations where the visual part is not coordinated with the spoken part, in fact where the visual part is directly counter-productive to the spoken part. As a result, they don't present themselves and their subject to their best. The term 'most presenters' includes all kinds of speakers, among them designers and design educators who consider themselves experts in information design and business people and other presenters without a formal design background. Working with a slide presentation has three parts: planning, design, and delivery. 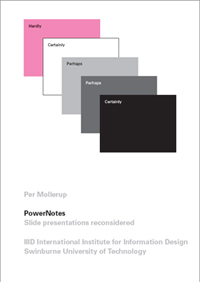 PowerNotes covers all three parts. Readers who must present before they can read the full book should rush to the Instant guidance section. It presents seven useful guidelines. PowerNotes addresses users of PowerPoint, Keynote, and other presentation software designed to enable presenters to make professional looking slide presentations. Professional graphic designers typically make their presentations with more advanced software and store them as PDF. These professionals may also benefit from PowerNotes, which is not software specific. PowerNotes is rich on recommendations that will help presenters to improve their performance. Professional opera singers sometimes turn their back to the audience, sometimes lie down, or even eat, while singing. In the same way, skilled presenters occasionally bend some of the otherwise sensible recommendations presented in PowerNotes. That is their professional prerogative, earned by talent and practice, lots of practice. Everybody should learn the rules before breaking them. This entry was posted in Public Library by Robert Egger. Bookmark the permalink.